The use of precious metal gold is implemented for optical media with the intent of extending longevity, especially for archival purposes. The average disc may not provide the reliability and durability of a gold CD or other media format. 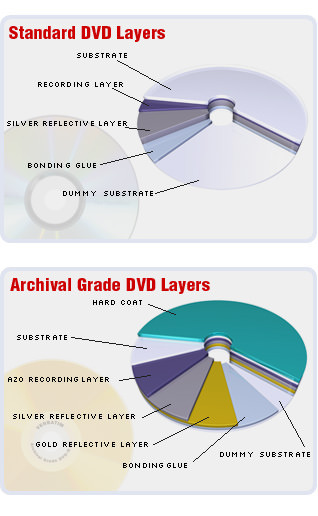 Standard discs in the ROM, R, and RW/RE format employ an aluminum reflective layer for data to be read by the disc drive’s laser. Due to the properties of aluminum, it is highly susceptible to corrosion which can therefore shorten the lifespan of the disc. Consequently, 24 carat gold and occasionally pure silver replaces aluminum for some manufacturer discs to combat corrosion. Aluminum disc layers can start to rust immediately after coming into contact with air. To a lesser extent, silver will also oxidize but at a slower rate—it’s weakness for tarnishing is its contact with sulfurous materials. Traditionally, a protective lacquer coating is meant to shield aluminum and silver alloyed layers as well as the disc’s subsequent layers from environmental factors but it’s not always impenetrable. Corrosion can still occur even with the use of a hard lacquer. The use of gold in a disc’s reflective layers provides manufacturers with a significant upgrade in quality and shelf life. Pure gold does not oxidize in air or water or most other elements it could encounter under normal circumstances. Therefore, it maintains its luster for reflective purposes over a longer period of time. In fact, one manufacturer tested gold discs and found that the disc’s lifespan was approximately 300 years, defeating the average 25-100-year lifespan of aluminum layered discs. Archival gold discs can endure greater doses of prolonged UV, humidity, and heat exposure in conjunction with a high grade of Phthalocyanine dye. These discs are available in the R format for CDs, DVDs, and Blu-ray media. You will notice that the quality and durability is reflected in the price of each disc. Currently, they are roughly $3 per disc. Note that gold discs are not stronger than standard manufacturer discs when encountering the impact of physical damage.